Seems like a good idea for thread .... but I haven't eaten lol. So that's about my food today: dinner at 5'o clock (if that counts as dinner) at haven't got supper yet (it's now near midningt) and my stomach is making sounds. Bleh this thread is a mistake. :/ It making me hungry. Supper is rice with raisins, pistachio, and olive oil. Surprisingly match pretty well. I dunno never had it checked. So what's for dinner Sal? Yesterday's? Egg and sayur asem (google it). Well, sorry if this sound meddlesome but your probably should. I had digestion problem myself for years, an once I got checked and get medicine, well, it helps. I don't have money to go to the doctor all the time, but when it got really bad, the meds really help. Also important is that I now know what the problem is and I also know that it is not something worse. Yesterday ... I didn't really got full meal at all I think? It was mostly snack all day... oh, wait I did got some decent meal in the morning/late morning at KFC: a fish bento. I can't handle too much chips and sugary drinks. Yesterday's late lunch: fried noodle. Today's breakfast: Instant chicken & mushroom noodle. I'm going to go out on a limb here and say you like noodles. LOL depend on the noodles. I just happen to had craving for fried noodles from two days before yesterday. Thus the lunch. For the dinner, my family happens to go a restaurant that made good noodles and I always want to try Yi fu nooble after seeing in manga (hell's kitchen) once. Supper is takeaway from said place. Wait, when you say noodles, are you talking about Bakmi, Lo Mien, Ramyun, Soba, Ramen? Huh, the capital is also here. The previous ones I eat? They are in order, some packaced noodle of whatever brand, Bakmi GM, Bakmi GM, Indomie. Noodles that i like? Again, depend on the noodles. Today's breakfast is Indomie fried noodles with egg on top. Bakmi GM is quickly becoming the good Mcdonalds of the Bakmi world. Sure it's everywhere, but they do maintain their quality control, and that's praiseworthy. Ahhh, the generics. Tastes good but still really easy to make. Unless if you have hardboiled eggs alongside with fried indomie, and in that case I'll call you a heathen. IMHO, best Bakmi ever however is still from a store neamed Bakmi Gajahmada (not relation to Bakmi GM despite the former often shortened to Bakmi GM as well) in Sidoarjo. If you or anyone ever pass Sidoarjo I heartiliy recommend it. Just look for Gajahmada street. Oh, and yesterday's breakfast was instant Spaghetti bolognaise. I guess I do like them noodles. I had mongolian buffet. It was filling albeit a bit bland on flavor. Some actual gastronomy for this thread for once! So few weeks I found an instant hamburg steak package at a supermarket. it became new family favorite. I complaint about its overfirmness though. Hamburg is supposed to be soft! After several times buying though, my older brother stopped wanting it, claiming bad MSG aftertaste. 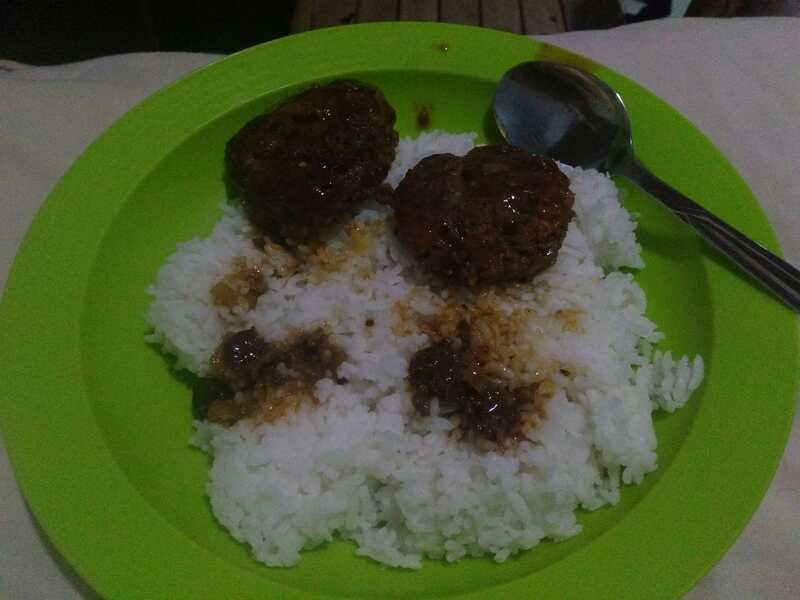 So, in the spirit of wannabe chef, and since it been a while since I last cooking, I decided to make some hamburg steak myself. A pinch of blackpepper, grounded. 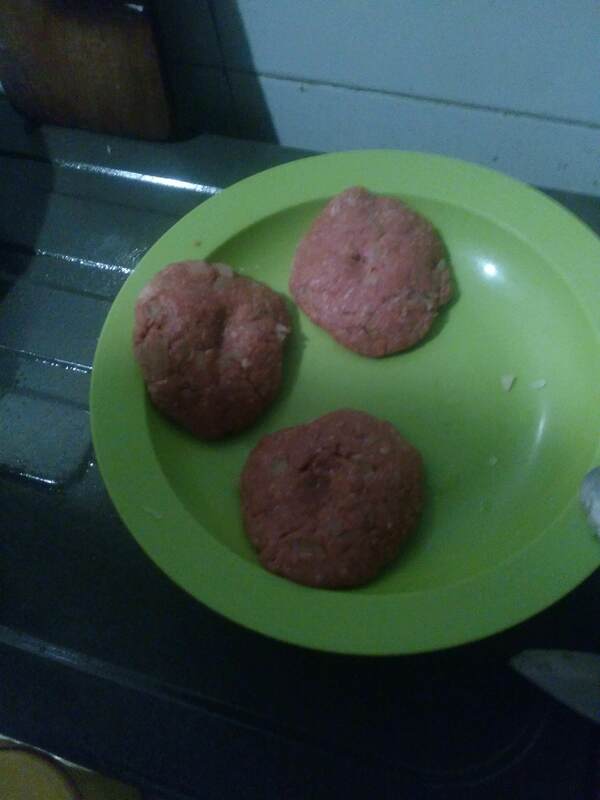 As the normal recipe goes, I sauteed the onion, mix it with the beef and and other ingredients, and knead into ...err, slabs of beef mix? Fried both sides of each piece a bit in the pan. The usual business.
. Hence why I whimsically add raisins in attempt to add at least some grapeness. Also adding that bayleaf even though no recipes call for it whackjob attempt to add flavour to compensate the lack of grape juice/red wine. 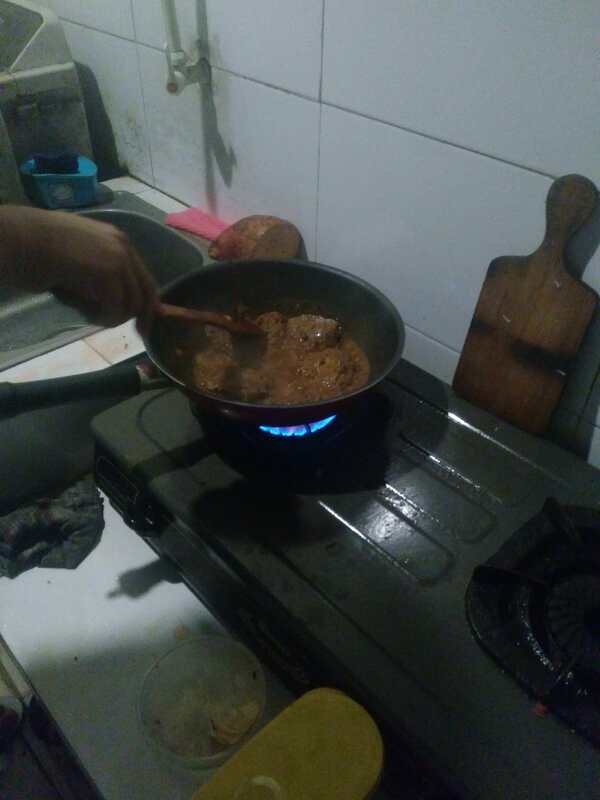 Anyway, so I added water to some pieces of the fried beef, added bay leaf, and raisins, and boil them for a while. After which I add the remaining ingredients, and return the hamburg into the pan for them to finish cooking in the sauce. End results, hmm. I think I messed up a bit. I got too much meat. Should have increase the amount of seasonings first, not only because there's more beef but also because considering my family's tongue, we are too used and in favor of lots of seasoning that a westerner or Japanese measure won't up to task. Also made them too thick. Fumbled a bit when flipping causing some cracks. My mother also said I used wrong type of panko and add too little. I dunno about that but ah well. As far taste goes, well, the sauce is done pretty well I think. It taste different from the laste time I made but of course it is since I use different mix (previously I improvised sometihng out of oyster sauce, salty soy sauce, sweet soy sauce, ketchup, and I forgot what else if any). The hamburg themselves taste like it could some improvement however. Ah well. At least my brother got his free-msg and less fatty hamburg while I got my soft hamburg plus for once cooking for someone else. (My mother praise my cooking sometimes, but both because of health and taste don't into most things I eat beyond taste testing, so I really just cook for myself when I do). @Salbazier. Just curious, but what is tepung kobe in English? I kinda would like to ask for that at the Asian market here. But I have no idea what Americans call it. More seriously, 'Kobe' is a brand not a type. I dunno, try asking 'flavoured flour to fry food'.